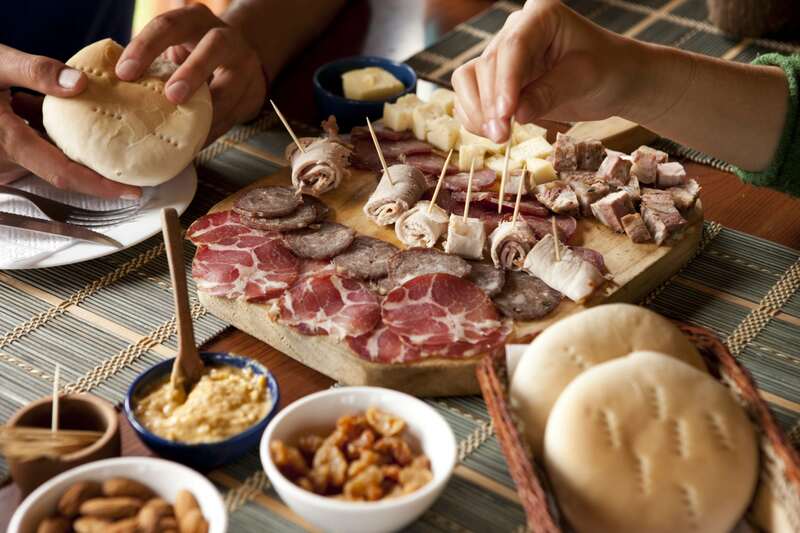 Borrowing from its blended culture of indigenous, Hispanic, and European influences, Chilean gastronomy has become one of the most interesting culinary scenes on the continent. Utilizing fresh local produce like avocados and corn, plentiful seafood from its 4,270 km (2,653 mi) coastline, and native flavors like maqui berry or cacho de cabra (goat horn) chiles, Chilean have produced a huge variety of unique dishes that highlight the flavors of each region, but there are some classics that are beloved the whole country over. Here’s just ten examples of the best Chilean food and drink that you need to try when visiting Chile! 1. 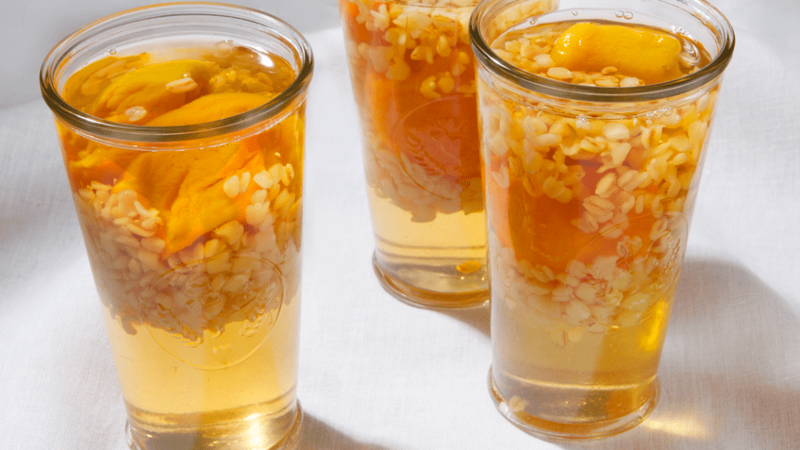 Mote con huesillo – This strange looking but a refreshing drink is summer in a cup for Chileans! Meaning “wheat with peaches”, it’s part liquid, part solid. The liquid part is dehydrated peaches brewed with a sweet, “nectar” type mixture of water, cinnamon, and sugar. Then, when this has cooled, add a ladle of the liquid and one of the peaches to a plastic cup filled with cooked husked wheat kernels. Sugary sweet and a great drink for all ages, a popular place to enjoy this beverage is at the top of Cerro Santa Lucia in Santiago. 2. 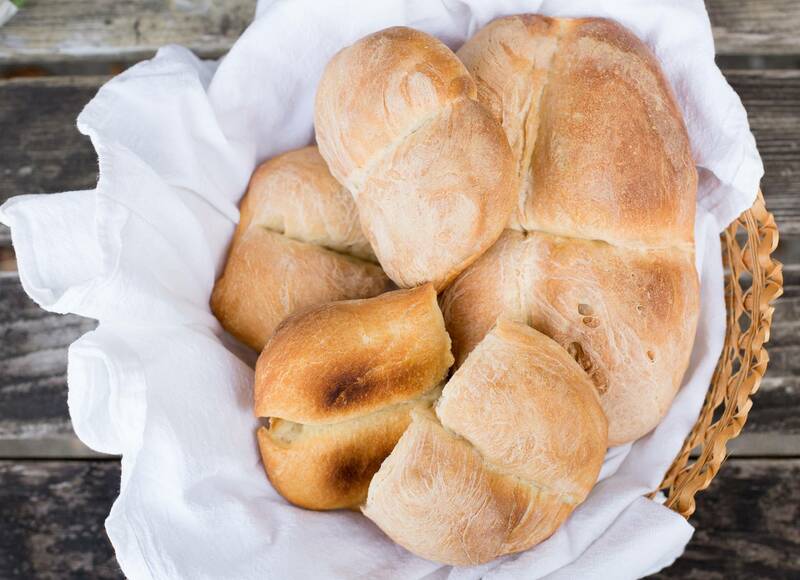 Marraqueta bread – In Chile, fresh bread is a daily part of life. Either in the morning or before going home from work, Chileans will head to their neighborhood “panaderia” to stock up on bread for the night and next day, and the most popular kind of bread in Chile is the marraqueta. Super easy to make and share due to their shape, marraquetas are great for making sandwiches or enjoying with butter or avocado at Chilean “once” (teatime), an evening tradition where, instead of dinner, Chilean families gather around the table to eat bread and sweets and drink tea while talking about their day. 3. Sopaipillas – A classic street food throughout Chile, sopaipillas are small disks of Andean pumpkin mixed with flour and fried in hot oil. Just a single one will set you back about 200 Chilean pesos (roughly 30 cents USD) and you can top it off with ketchup, mustard, or pebre, a Chilean version of pico de gallo. During the winter, you can also soak them in a sweet syrup to make “sopaipillas pasadas”, which is a tasty breakfast treat or can be eaten for dessert! 4. 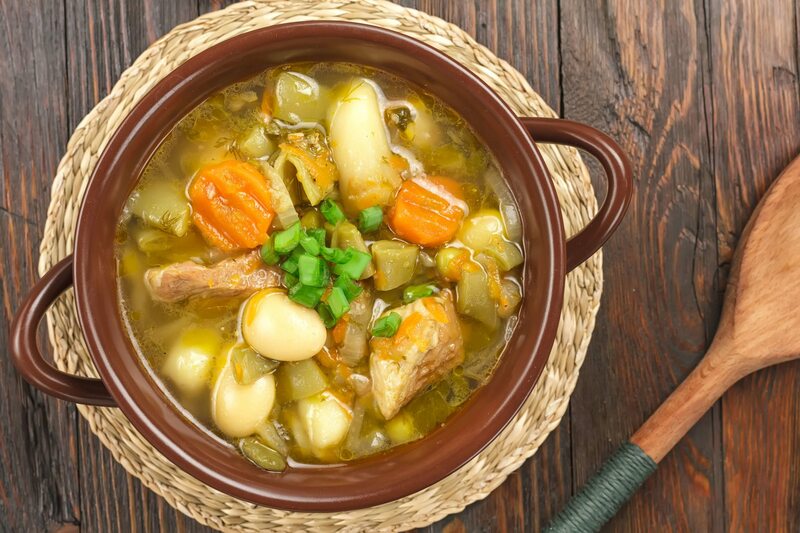 Cazuela – Cazuela is to soup in Chile as chicken noodle soup is to soup in the States: it’s a classic and everyone has their own way of preparing it. Cazuela can be made with several different kinds of meat, such as different kinds of seafood, but beef or chicken are the most common. The meat of your choice, chunks of potatoes, carrots, and other veggies are added to a simmering broth, cooked until done, and then everyone gets to pick and choose what kinds of vegetables and meat they want for their individual serving. Cazuela can be eaten the whole year round but is especially popular in fall and winter. 5. 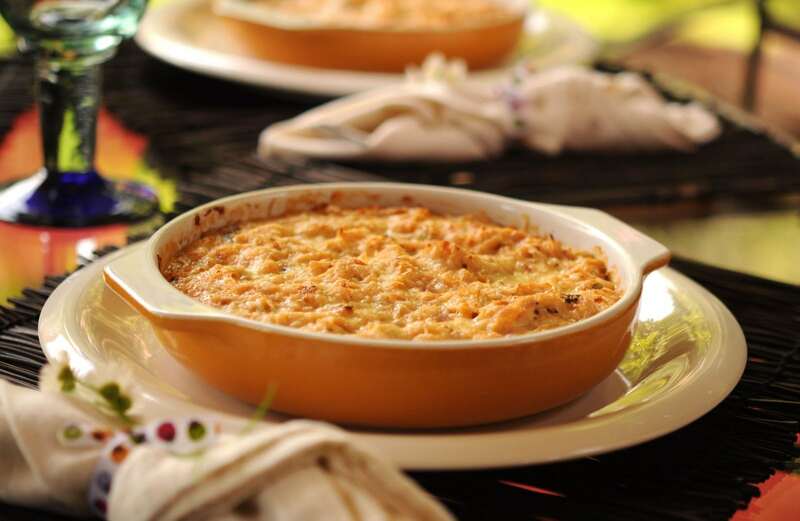 Pastel de jaiba – The waters of southern Chile are literally crawling with gigantic king crab, which is the main ingredient of this gut-busting crab pie. King crab meat is mixed with cheese, bread, and cream before being baked to gooey perfection. 6. Chacarero – If there’s one thing Chileans know, it’s how to make a good sandwich and the Chacarero is one of the best. This behemoth was named one of the most amazing sandwiches in the world by TIME Magazine and it’s easy to see why. A huge piece of Chilean bread is cut in half, covered in homemade mayo and any other condiments you desire, and then piled high with thin, sizzling slices of steak or pork, sliced tomatoes, pieces of chile pepper, and then (wait for it) a heap of green beans! 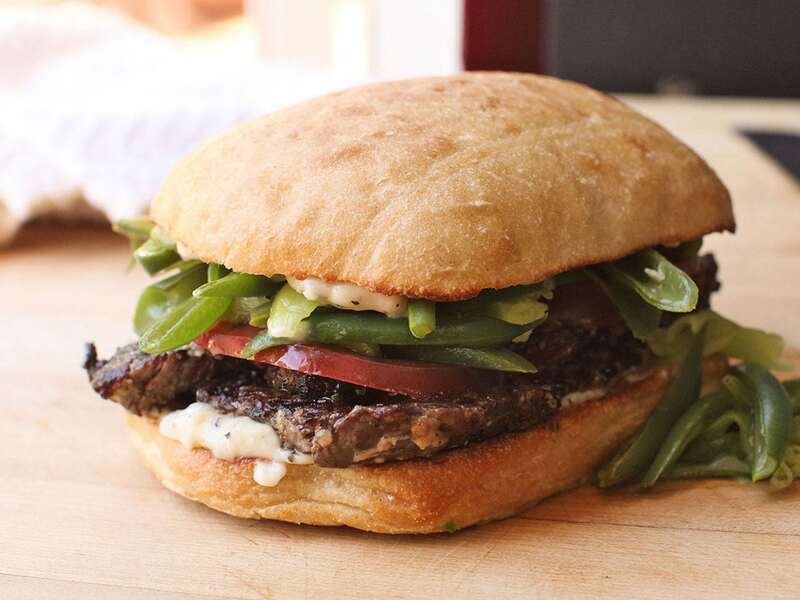 The green bean addition is what deters most visitors, but don’t knock it until you’ve tried it! 7. 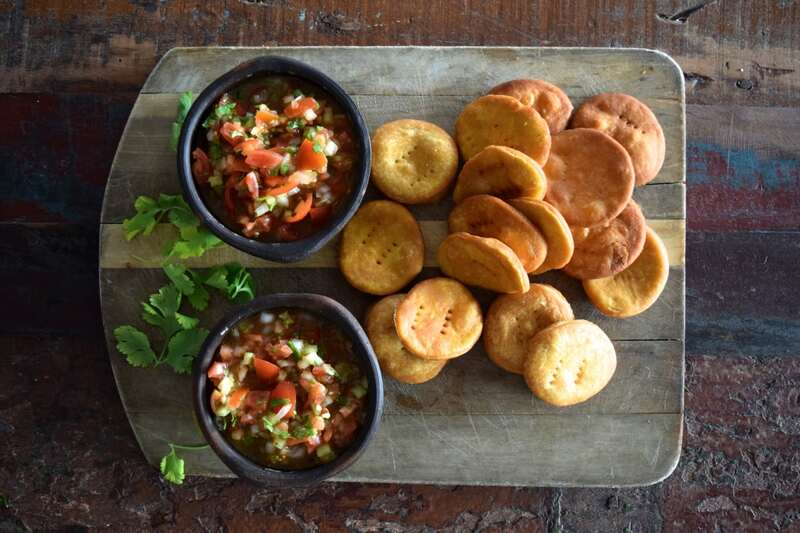 Chorrillana – Chileans love to party, and when the fun is done, you need something to soak up all that alcohol. 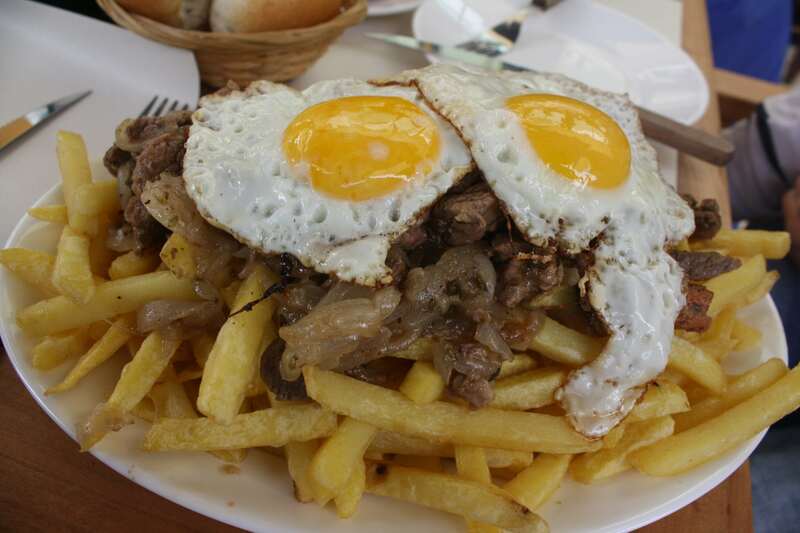 Chorrillana is the ultimate drunk food: a plate of greasy french fries topped with sliced hot dog, slabs of beef, fried onion, and sunny-side up eggs. Share with a few friends and you have the perfect end to a great night out on the town! 8. Patagonian asado – If you’re planning on visiting Patagonia or Torres del Paine during your visit to Chile, you need to make time to partake of an authentic Patagonia asado (barbecue). In the past, the wilderness of Patagonia was colonized and presided over by baqueanos, the local version of cowboys. But instead of cattle, they herded sheep, whose wool was prized back in Europe. 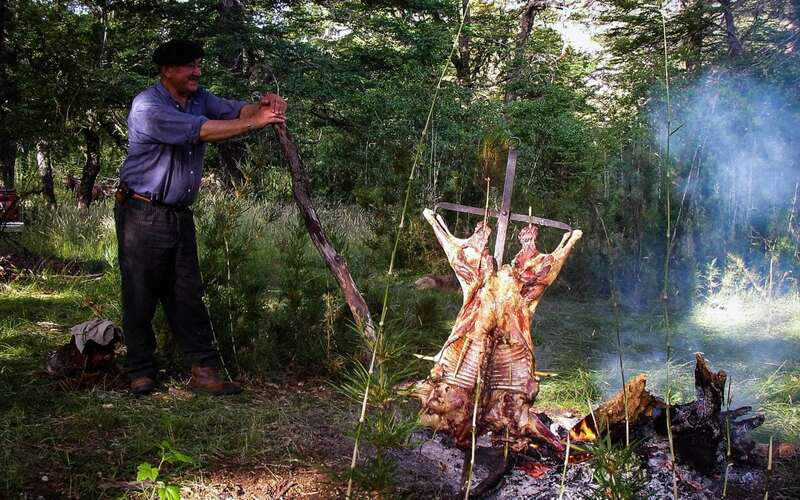 During the long stretches of time spent at their ranches or while out in the fields, they created the Patagonian asado, which is butterflying a lamb over an open fire, cooking it for about three hours and moistening it with a mixture of warm water, salt, and garlic, until the meat is tender and juicy. Top it off with a glass of Chilean red wine under the Patagonian stars and you have the recipe for an unforgettable barbecue! 9. 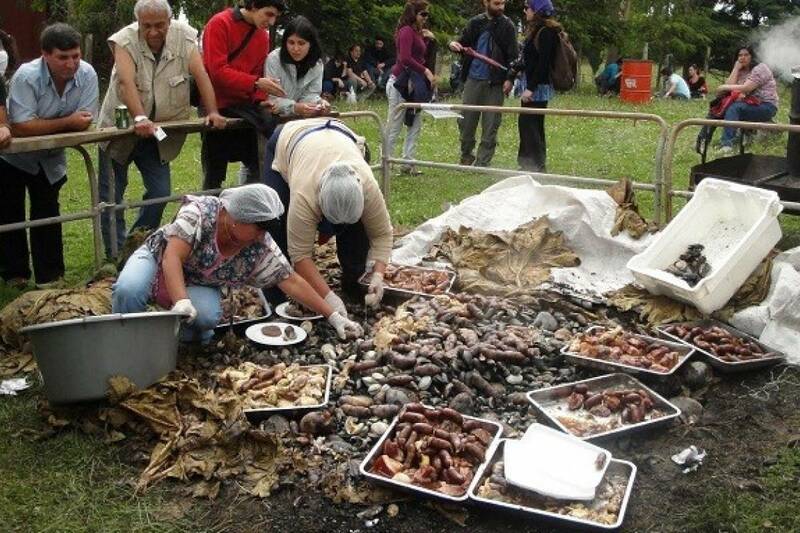 Curanto – The preparation of this dish, which is native to the Chiloe archipelago in the south of the country, is similar to a traditional clambake. After filling a hole with hot stones that have been heated in a fire, the hole is filled with clams, mussels, sausage, chicken, potatoes, milcao (a type of potato patty), and veggies, which are then covered with large nalca leaves and left to bake for several hours. When the dish is done cooking, the leaves are removed and everyone gets to enjoy this delicious Chilote smorgasbord! 10. 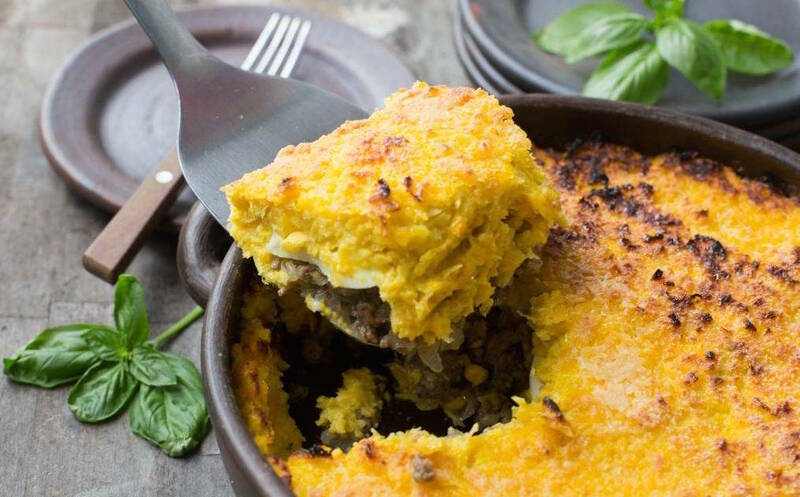 Pastel de choclo – Corn is a key part of the Chilean diet, so of course one of their most famous and popular dishes is a corn pie! Similar to the English “corn pudding”, the corn is ground into a paste and mixed with seasoning, before being baked in a clay bowl that’s filled with ground beef, chicken, pieces of hard-boiled egg, onions, and black olives. The result is a cozy, homestyle dish that’s great for cold winter days.